We had a short day of riding to savour our last day in Slovenia. Again we enjoyed beautiful scenery and forest riding and a blue sky sunny day. Our campground was set in the bush and we found ourselves a nice terraced spot - not much grass but it was a great spot! In the afternoon we visited some great caves. They are 200,000 years old and we went about 5km through them on a train that made us feel like we were in Disneyland! We did get to do some walking though - the temp is a constant 8° or so in there so it was good to be forewarned to take something warm. 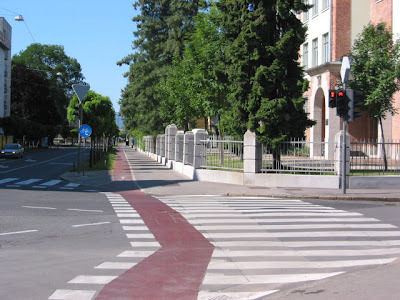 This first photo is a good example of some of the bike routes we get in the cities - this was Ljubljana as we headed out of town. You can see we also get our own little bike light alongside the pedestrian light. 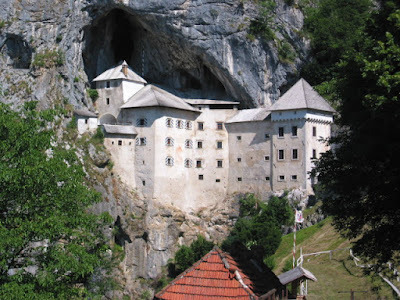 The second is of Predjama Castle - built in a cliff and has stood since 1201. The third photo was a great treat - we had left the castle and were thinking it was about time we found some morning tea. 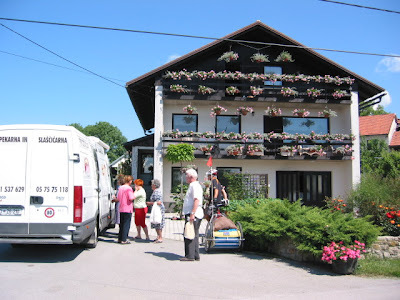 We were in the middle of nowhere significant, but as we cycled into this tiny wee village we spied the bakery truck in a driveway, so there was our morning tea!!! It also gave the locals a wee giggle.